The ultimate houseboats in the Echuca, Moama, and Rich River region. Murray River Houseboats’ strategy and focus has simply been to offer the best appointed and presented vessels in all categories whether being our immaculate middle class boats or our pride of the fleet, Indulgence and Decadence. Indulgence has been featured on Coxy’s Big Break and touted by the Herald Sun as the “QE11 of the Murray”, whilst Decadence, being our latest addition, is certainly following suit with the amazing feedback we have received. Since acquiring Murray River Houseboats a few years ago, we have worked tirelessly under the guidance of an interior decorator to raise the bar of our existing fleet whilst also offering a competitive price. Our next step was to build a vessel under the guidance of an architect and interior designer, which would create a new level in houseboating, particularly for the most discerning eye looking for the absolute best. Our brief to the professionals was “we want all class , the ‘Wow’ factor and every inch of space utilised to advantage.” Hence Indulgence was created, followed by Decadence our most recent acquisition. Our customers are working harder and longer, and look forward to their holidays so why shouldn’t they have and deserve the absolute best return for their money. Our philosophy has been to increase our bookings through referrals and by increasing our return customers. Consequently, this reduces our advertising costs and therefore allows more to be invested back into improving our fleet and our customer’s satisfaction. This is our ongoing objective. 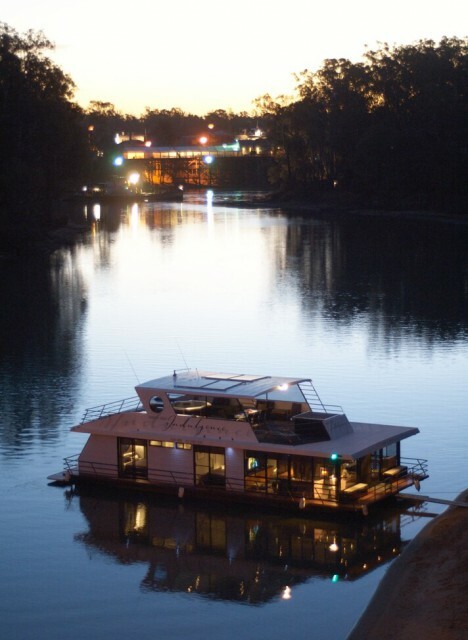 "The ultimate Murray River houseboat. This is less a houseboat than a mansion boat." "The QE2 of the Murray River."